· Gem: Two Natural Black Triplet Opal Stones Gem Quality: A . The clear capping may also magnify the colour of the opal slightly, and also serve to protect the opal. Black opal is the most valuable type of opal and it is predominantly found in Lightning Ridge. · Gem: Natural Black Triplet Opal Stones 10pc Gem Quality: A . · Opal Weight: 5.115 cts (10 pieces ). · Opal Size: 6x4 mm. · Gem: One Natural Black Triplet Opal Stone Gem Quality: A . FREE JEWELLERY BOX! · Opal Size: 7x5 mm. · Pendant Size: 19x10x4 mm Solid Silver Set and stamped 925 at the back of pendant with yellow gold plated. · Gem: One Natural Black Triplet Opal Stone Gem Quality: A . · Opal Size: 14x10x4 mm. · Opal Weight: 3.60 cts & 0.72 g.
Opal Size 12x10mm Opal Natural Black Triplet Opal Pendant FREE JEWELLERY BOX!!! Triplets usually have a 'glassy' appearance and the light reflects differently from the top of the stone. If the back of the stone appears to be black plastic then you are not looking at a solid stone. Unlike natural opal, Gilson created opal is much tougher and not prone to breaking. It gets its hardness because it contains no water. Unlike natural opal which does contain water. Opal triplets are a good alternative to solid opals, because the quartz cap adds extra strength and depth to the otherwise fragile opal. · Gem: One Natural Black Triplet Opal Stone Gem Quality: A . 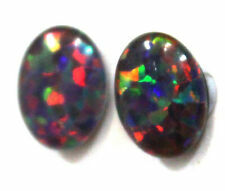 · Opal Size: 14x10x4 mm. ·Opal Weight: 3.60 cts & 0.72 g.
Over 100,000,000 served. FREE scheduling, supersized images. (Buy 2 bags and receive 2 free faceted gemstones, etc…). Treasure Hunt - 3000 Carat bags of Green Opal!! A Very NiceFree Faceted Gemstone! 3000 Carat Lots of Green Opal Rough - Very Nice. Each lot will contain pieces that range in size from 20 carats to over 100 carats each. Unlike natural opal, Gilson created opal is much tougher and not prone to breaking. It gets it's hardness because it contains no water. Unlike natural opal which does contain water. Opal triplets are a good alternative to solid opals, because the quartz cap adds extra strength and depth otherwise fragile opal. · Gem: Natural Black Triplet Opal Stones 10pc Gem Quality: A . · Opal Weight: 4.015 cts (10 pieces ). · Opal Size: 5x5 mm.